Death occurred to this jawan on this day (31st October) – 27 years ago – the dying of this man from Faridkot Dist of Punjab shook the entire Nation and was felt World over. For it was Beant Singh along with Satwant Singh standing as bodyguards assassinated the Prime Minister Indira Gandhi at her residence. Beant was killed in the gun fire. Satwant Singh was arrested and later sentenced to death along with conspirator Kehar Singh. The sentence was carried out on January 6, 1989. The assassination which changed the history of India was said to have been motivated by Operation Blue Star, an attack on Sikh separatists holed up in Golden Temple complex in Amritsar, India. Satwant Singh and Beant Singh fired thirty three bullets into Indira Gandhi's chest and abdomen. 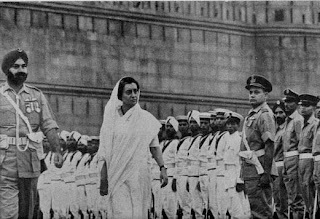 Indira Gandhi, unlike many other Prime Ministers of India was portrayed to be strong-willed, autocratic and determined to govern the way she wanted. 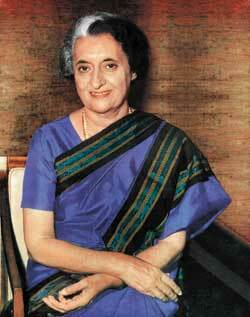 Mrs Indira Gandhi was Prime Minister four times and the dominant figure in India for almost two decades. She was born to politics and power, the granddaughter of Motilal Nehru, an early leader of the Indian independence movement, and daughter of Jawaharlal Nehru, who led India as Prime Minister in its first 17 years of Independence from Britain. It is indeed an inspiring story of Indira Priyadarshini Gandhi [19 November 1917 – 31 October 1984) who served as prime minister of India for three consecutive terms (1966–77) and a fourth term (1980–84). Though she was not the first female PM [the first being Sirimavo Bandaranaike of Sri Lanka) she is the world's second longest serving female Prime Minister. Noted for her charismatic authority and political astuteness, she had a chequered career often bordering on authority and conflicts. History knows her as the only Indian Prime Minister to have declared a state of emergency in order to 'rule by decree' and the only Indian Prime Minister to have been imprisoned after holding that office. She had seen it all – way back in 1966, the Congress was split in two factions, the socialists led by her, and the conservatives led by Morarji Desai. She had to accommodate Desai in her cabinet. In July 1969 she nationalized banks. On 12 June 1975 the High Court of Allahabad declared Indira Gandhi's election to the Lok Sabha void on grounds of electoral malpractice. During 1975 – 1977 India saw Emergency being declared, arrest of most of opposition and some disorder. President's Rule was imposed on the two opposition party ruled states of Gujarat and Tamil Nadu thereby bringing the entire country under direct Central rule or by governments led by the ruling Congress party. The immediate elections after emergency saw the Nation having the first non Congress Govt led by Janata Party, which however failed to last the full term due to internal squabbles. She will be remembered for the strong action during the Indian war against Pakistan in 1971 leading to the formation of Bangladesh, as a new Nation. In 1979, she could come back to power with a landslide majority. The early 1980s saw the devaluing of rupee. For any visitor to Delhi, the blood stained saree and her belongings preserved at Indira Gandhi Memorial Museum in New Delhi would kindle sympathy and sadness at the loss of her. On this day, she was shot savagely and died on her way to the hospital.